Teddy Roosevelt would exclaim “bully” to Disney’s dramatic depiction of an early 1900s national park lodge. 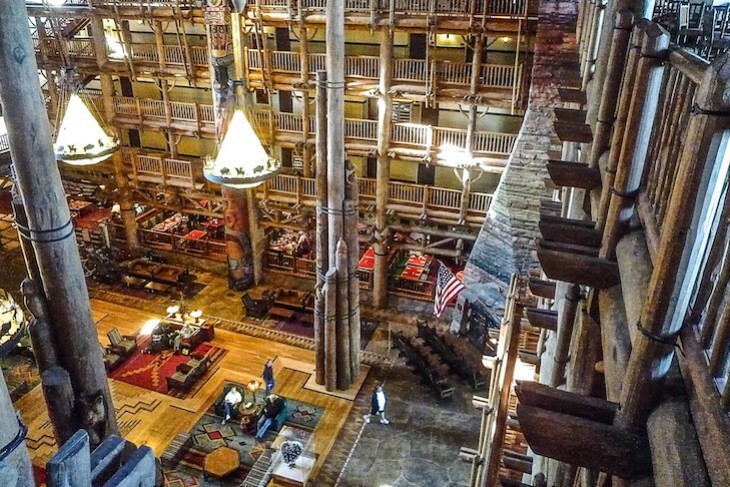 I challenge you to keep your jaw from dropping open on your first encounter with its awesome eight-story lobby. A marvel of timber, sheer walls of lodgepole pine logs and rugged rock surround the huge, open expanse filled with oversize leather chairs and Native American crafts of beaded moccasins, feathered headdresses, textiles, and drums. 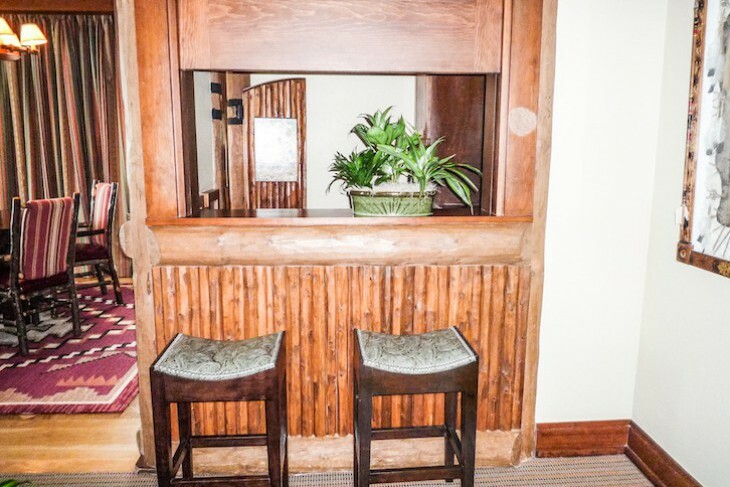 Two authentic 55-foot Pacific Northwest totem poles overlook rustic stone and hardwood floors topped with Native American rugs, tepee-topped chandeliers, and a bevy of “park ranger” staff who roam the lodge attending to guests. 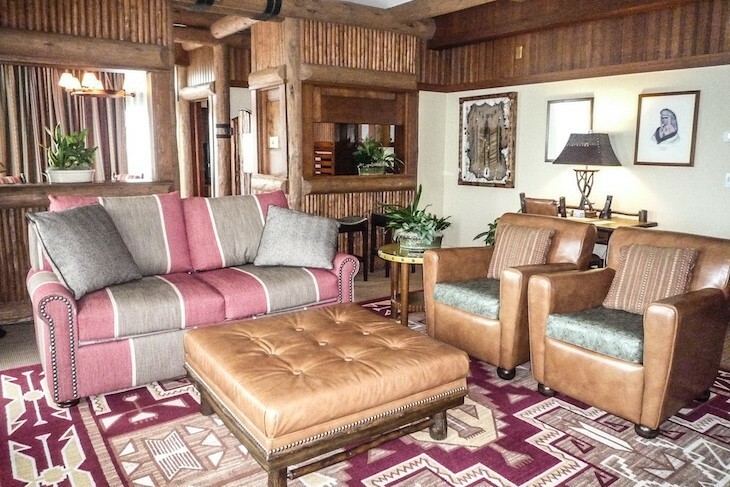 A favorite pastime is relaxing in rocking chairs fronting the massive, 82-foot-tall fireplace composed of rockwork replicating the diverse strata of the Grand Canyon. Another is finding peace and quiet in the seductive nooks and crannies on the floors above the lobby or on the back porch rockers that overlook a serene scene of natural beauty. Seven floors of guest rooms are to be found above the lobby level, and two six-story wings composed of quarry stone, chunky logs, and green tin rooftops are surrounded by an enchanting scene of roaring waterfalls, rushing creeks, and towering pines. 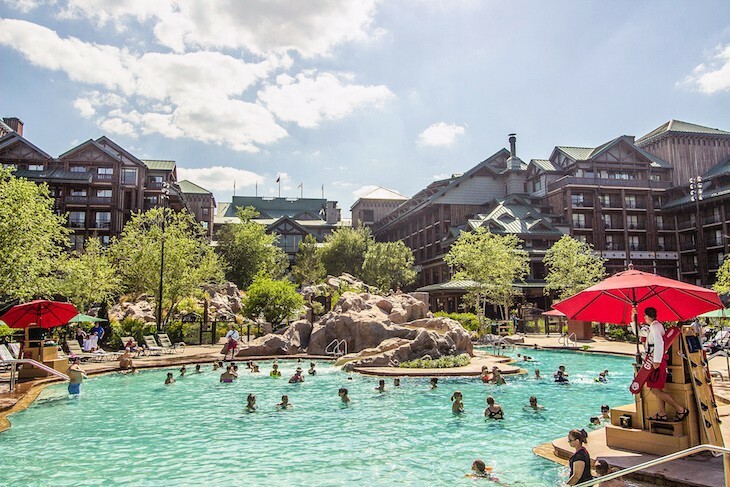 What begins in the lobby as a bubbling hot spring turns into Silver Creek which in turn widens to become a sparkling waterfall emptying into the boulder-lined, hot springs–style Copper Creek Springs Pool, one of Disney’s best. Listen for crickets chirping beneath the bridges and along the meandering pathways lined with natural grasses, junipers, sotols, and wildflowers. 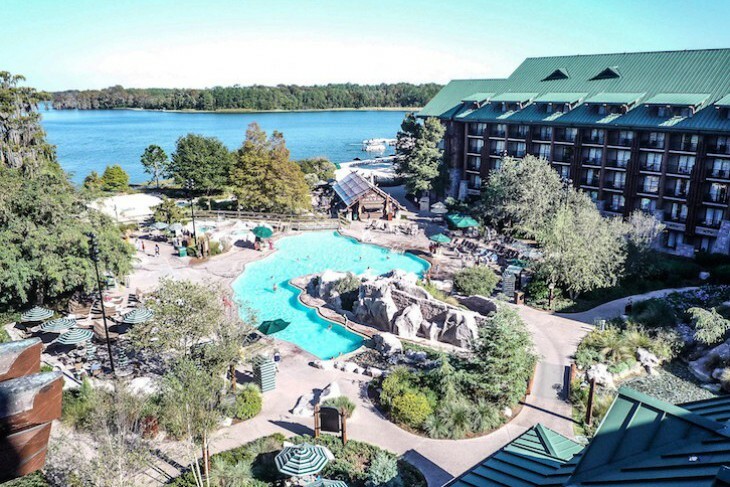 On the shores of Bay Lake, the resort’s very own re-created geyser, surrounded by a steaming expanse of geothermal activity, erupts at the top of every hour from early morning to late night. 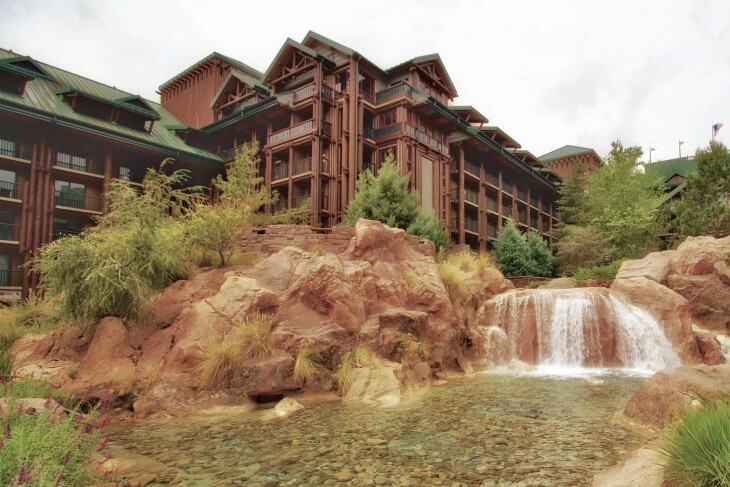 Wait until after dark when the waterfall is lit and the scenery is even more spectacular. 725 rooms. 901 Timberline Dr., Lake Buena Vista, FL 32830; 407-824-3200; Fax 407-824-3232. Check-in 3 p.m.; Check-out 11 a.m. The waterfall is lit beautifully at night. The rushing creek runs into the boulder-lined swimming pool. Baths are a few feet smaller than other deluxe resorts. 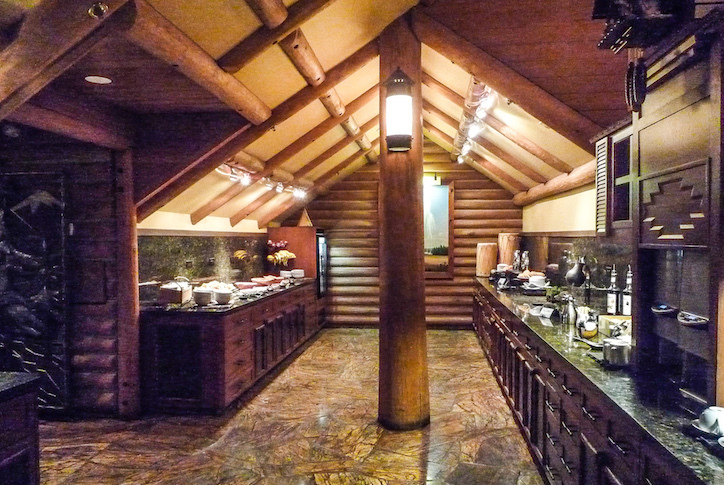 Yosemite Suite's walk-in wet bar. Those who have experienced other deluxe Disney resorts may be surprised at the smallish guest rooms here, measuring only 345 square feet. Though pleasant, they are a tight squeeze lacking even the room for a sitting area. Bedding is either two queen-size beds or a king-size bed (wheelchair-accessible rooms). Crisp white duvets, striking royal blue runners in a Navaho design, and cranberry red throw pillows with a Thumper theme. Carpeting is a burnt orange, blue, and tan Native American print, walls are butter yellows, and a 32-inch flat-panel TV is built into a dark wood bureau accented in blue stripes. Headboards are padded red leather with a carved woodland scene, and linens are triple-sheeted with nice downy pillows. A second bureau is located in the foyer. All rooms come with a table and two chairs, undercounter refrigerator, keyed safe, and coffeemaker. 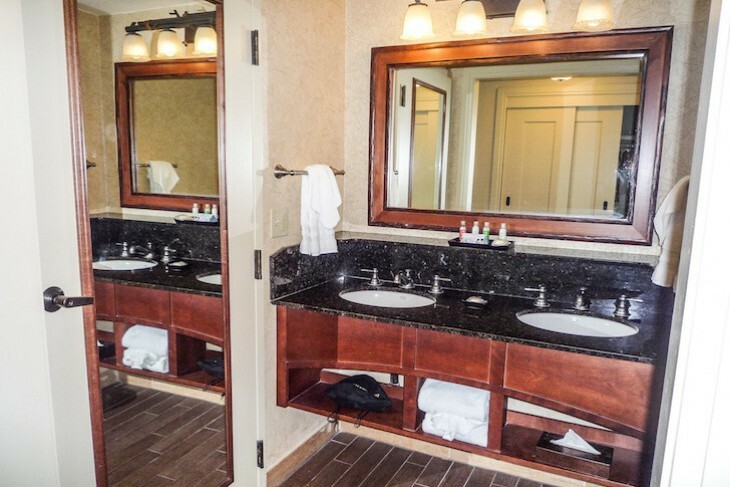 Bathrooms, a few feet smaller than other deluxe resorts, have attractive black/gold granite countertops in the separate vanity area holding two sinks; an adjoining bathtub/commode area is embellished with accent tiles featuring Meeko, Bambi, Chip ‘n Dale. There’s no makeup mirror, but the full-length mirror, curved shower curtain, and rain shower–style showerhead are a plus. Other room amenities include a keyed safe, iron and ironing board, and daily newspaper. Room view choices include: Standard View with a look at either the parking lot, service area, or rooftops; Nature View facing the woods; Courtyard View of the pool and/or Bay Lake. New for 2019 is a Nature Fireworks View, some with a partial view of the Magic Kingdom fireworks show from floors 4, 5, and 6 (on request only), all with a view of the Copper Creek Cabins. Sixth-floor rooms in the outer wings closer to the lake come with dormer balconies that require standing for a view. Concierge rooms on one half of the seventh floor (the other half being the Copper Creek villas) include standard-size rooms with a variety of views and the Yosemite Suite. All 7th-floor concierge rooms have dormer balconies that require standing for a view. Although none are located on the club level’s seventh floor, Deluxe Rooms do come with concierge privileges. At 500 square feet and sleeping six these rooms offer a comfortable, but not huge balconied parlor area holding a queen-size sofa sleeper, two brown leather chairs, small table and two chairs, coffee table, flat-panel TV, wet bar, coffeemaker, and small refrigerator. The bedroom, separated by a frosted glass French door from the parlor, has two queen-size beds, TV, and a French-style, stand-up balcony. The double-sink bathroom with separate commode and shower area can be accessed from either the bedroom or the foyer. Most of these rooms come with some sort of water view, and because of the distance from the concierge lounge have their refrigerator stocked with beverages on request. Concierge guests receive the services of an accommodating private staff and access to the Old Faithful Club. 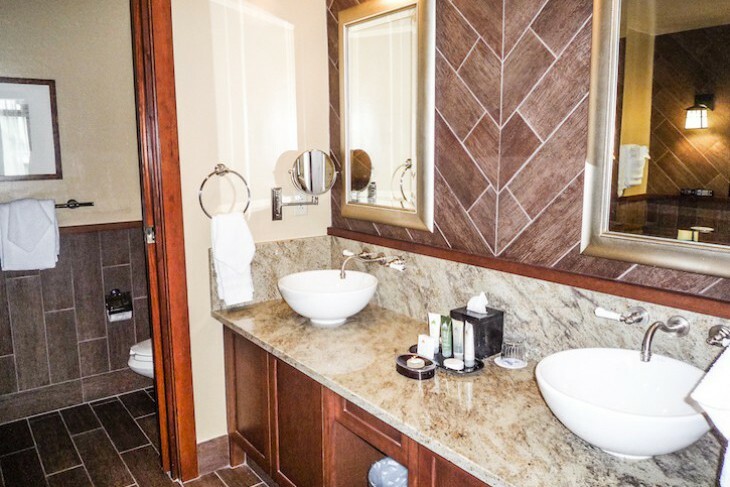 Additional concierge amenities include robes and nightly turndown service. A scattering of tables are set up around the balcony overlooking the lobby and small lounge and small stand-up balcony adds to the appeal. And those that like beer will love that this is the only concierge lounge offering beer on draft. Concierge food and wine menus are posted each day just outside the serving area. Breakfast consists of fresh fruit, juice, yogurt, pastries, cereal, oatmeal, mini muffins, breads and bagels, and afternoon snacks are make-your-own trail mix, fruit, gummy bears, olives, crudités, homemade chips with dip, and cookies along with tea, lemonade, Geyser Grog, and spa water. Evenings bring hearty food catered from Whispering Canyon Café. Cold items could be antipasto salad, crab orzo salad, ceviche, greek-style salad, and always an artisanal cheese platter, and hot dishes include a hearty soup, wild game stew, BBQ chicken skewers, sweet and sour venison meatballs, and house-smoked pork sandwiches. Wine offerings are Domaine Ste. Michelle Brut sparkling wine, Chateau Ste. Michelle Riesling, North By Northwest Chardonnay, Milbrandt Cabernet, and Cloudveil Pinot Noir. There’s also a self-service cappuccino machine. After dinner wine and cordials are served with scrumptious hot cobbler, mini cupcakes, s'mores in a jar, cookies, macaroons, brownies, and rightly famous Magic Bars. 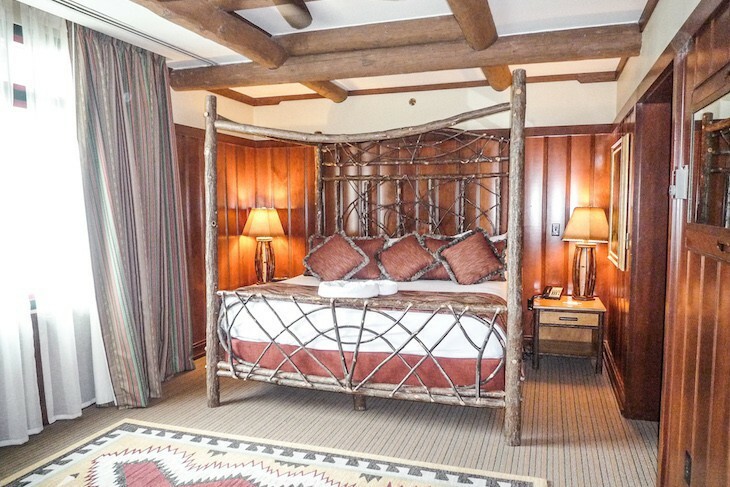 Only one suite, the 885-square-foot Yosemite Suite, outfitted in upscale Western featuring rawhide curtains, branding-iron towel bars, Native American artwork, and lodgepole trim. Less kitschy and more sophisticated than it’s previous décor, this newly updated suite offers a living area with gray-green and ruby red chenille sleeper sofa, two leather easy chairs, oversized ottoman coffee table, desk, framed Southwest prints, oversized flat-screen TV, DVD player, and stereo. Flat-weave carpeting is centered with a Navaho-style area rug. A wooden walk-in bar is complete with swinging doors, microwave, undercounter refrigerator, sink, blender, Keurig coffeemaker, and two leather-topped barstools. 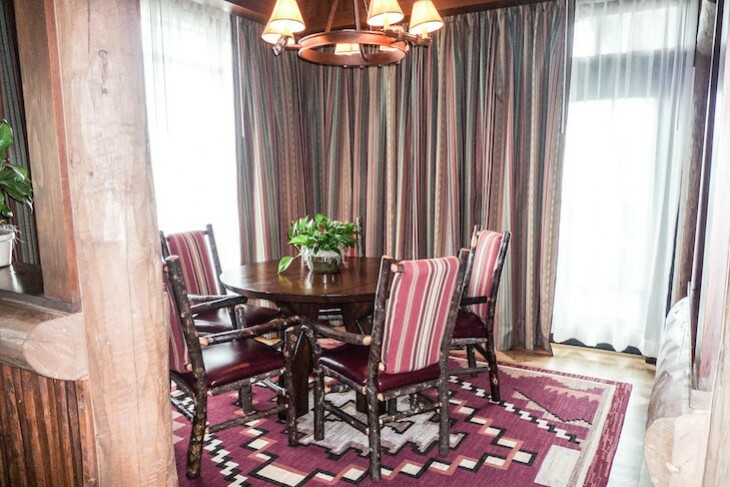 The small dining room has parquet flooring with a rustic, circular table and Navaho-print area rug. Off the entry hall is a half bath with single sink. An lovely balcony wraps around the living and dining area with marvelous views of the resort’s pool and geyser as well as sparkling Bay Lake. In the bedroom is a twig-style king bed with white coverlet bedding accented with rust red throw pillows and a Native American-style runner, a bureau with flat-screen TV, and green leather easy chair and ottoman. 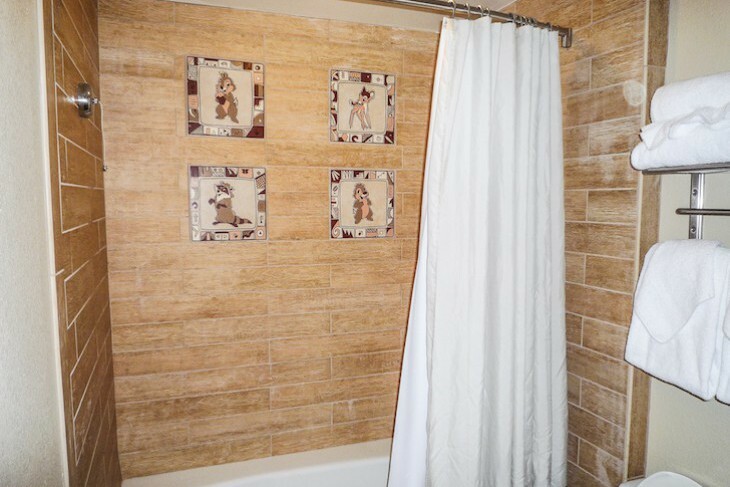 The only disappointing aspect of the suite is the master bath’s ultra-sensitive, automatic motion-detector vent fan that turns on upon entering the bath for irritating 30-second intervals. 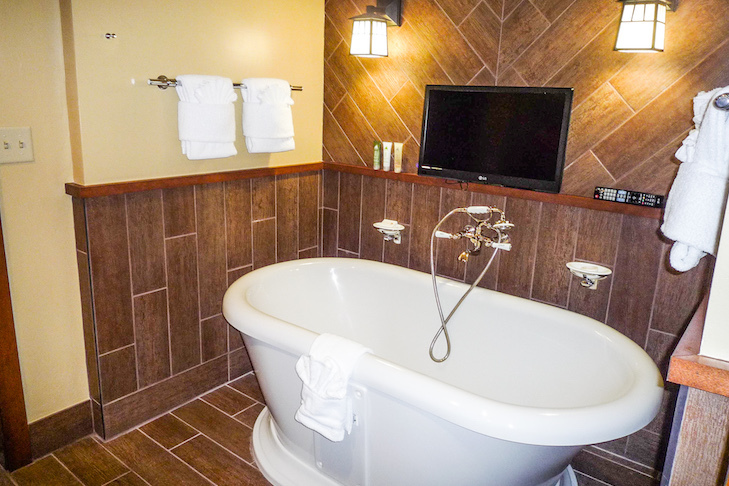 But the pluses outweigh with a freestanding tub over which is another TV. Double above-counter, white porcelain basins are set on a cream and gray granite vanity, and, in a separate area, is a commode and large shower. A second guestroom can be added to make a two-bedroom suite. 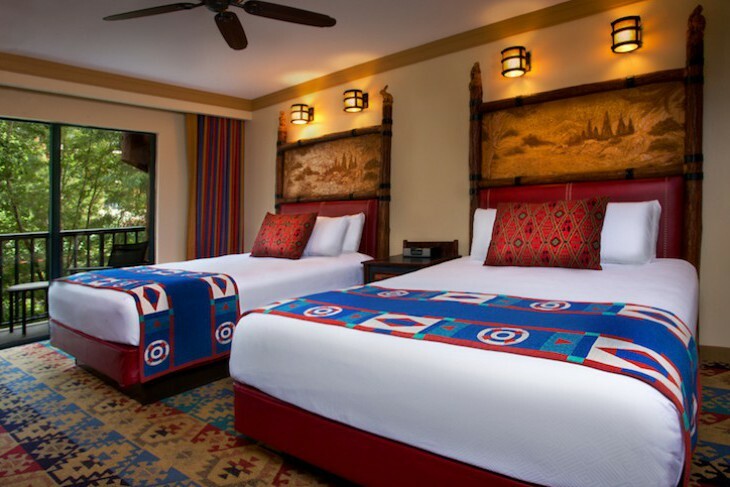 The Yosemite Suite is one of the better-priced suites at the Disney Deluxe properties and certainly one to consider for a nice upgrade.